Preparation PKMP impressed haste. Program that has long proclaimed, was still not optimal. Considered to be able to answer the complaints of students about Integrated Practice Teaching Profession (PPKT) are less effective for Study Program (Prodi) Education Management (MP), the implementation of the Employment Practices Education Management (PKMP) even less than the maximum assessed by most students. It is expressed chairman PKMP 2015, Wahidin, Thursday (24/9). According to him, PKMP held last August, are less able to cope with problems at school as a whole. In addition, students program planning is not fully implemented. "Supposedly, MP student can understand better the problems in school again," he said. One of the students participating in PKMP, Agung Saputra Wahyu said initially he was troubled when he andhis friend be the first batch to undergo the experimental program. Moreover, he recently received PKMP module of the committee in two days before the execution. This, said Agung, effect on student performance, both in terms of understanding and mastery. Even so, Agung stated, he prefers PKMP than PPKT. In addition to its shorter implementation time, he can focus more on school management rather than teaching. However, according to the Court, PKMP would be optimal if enacted next year tostudent of 2013/2014. PKMP is a new program that focuses on school management; the quality of education, infrastructure, educators, management information systems (MIS), and library management. PKMP discourse have long proclaimed by the department in the faculty meeting. However, a new program for MP will be implemented this year. At the beginning of this program was announced in May, PKMP have 0 (zero) Semester Credit System (SKS) and not compulsory for students of sixth semester. Thus recorded at least only 60% of 70 students MP in 6th semester that will follow the new program. In addition, the timing was not correct because in the holiday period and use personal budget. Therefore, at the end of May, the parties hold a meeting with students from the MP to discuss the benefits and plan imposes 3 credits in the program. As a result, a few days before departure, Integrated Service Unit (UPT) Laboratory of the Faculty of Imu Tarbiyah and Teaching (FITK) authorize PKMP and weighs 3 credits. 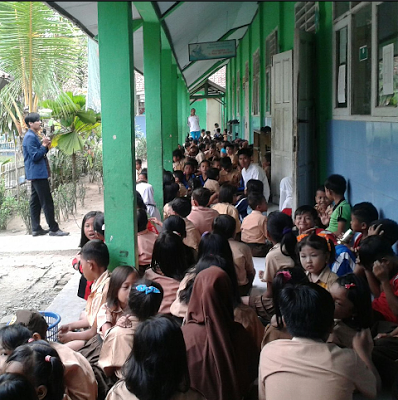 At the same time, the Prodi also agreed amount of funds that must be spent by student was Rp750 thousand per person. The money was used for accommodation and activities at the school during the execution PKMP because faculty did not give budget for these activities. Head of Unit Laboratory FITK, Ahmad Royani admit, implementation may seem impromptu PKMP because this is the first program in FITK. PKMP also do not have a handbook that should set the course of the program. "Should it if there is a book jalanin program guidelines, so there ngatur grip," he explained. This year, PKMP Cimarga held in the district, Banten in August 2015 for one month. There, students and faculty perform community service, study the administrative systems in schools, as well as examine the management of schools and libraries. Three points is a form of tri dharma college conducted academicians. In PKMP this time, the students perform two types of research. School management research conducted by each group and library management is done with lecturers. "Students process the data, while the lecturer helps analysis of research and act as advisors and mentors," said Agung. Coordinator PKMP 2015, Tri Harjawati said joint faculty research student gets big points in charging Workload Lecturer (BKD) to obtain certification of funds. In addition, Tri added, such research can maintain accreditation majors MP for the next five years. Because, to be good to make the accreditation department, the department should increase research and journals. On the other hand, the Head Prodi (Kaprodi) MP, Hashim Asyari said, research on the management of the library is a collaboration between faculty and students. However, in practice, said Hasjim, lecturer more dominant. Given this PKMP, he hopes to produce four products: a community service from faculty or students, lab reports, and research. "As far as I know, there are nothing like that in UIN," he concluded.